Ohio demands health care now! COLUMBUS, Ohio — My whole body was pounding from the roaring chants of “Health Care Now,” as I walked into the Expo Center at the Ohio State Fair Grounds here Sept. 1 evening. On less than a week’s notice, thousands mobilized to make their voices heard in favor of health care reform, with a strong public option. 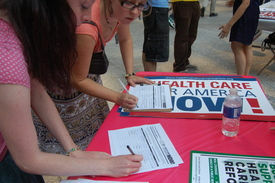 Thousands of more people have joined the fight for health care reform since August. A sense of urgency and determination marked the huge, energetic rally. Many expressed the need to counter corporate media claims that the public has turned against health care reform. “There are only a tiny handful of those ‘tea baggers’ outside yelling about ‘death panels’ and ‘Nazis,’ while thousands of us pour in here to say that we must have real health care for all,” said Susan Childs, director of Planned Parenthood here. The crowd, estimated at 2,500, included many unionists and hundreds of retirees, as well as younger folks, disabled, veterans and many who just wanted their voices heard. Reems is part of the Interfaith group, “We Believe,” which recently held public events supporting health care reform, the public option and calling for civility and honestly in the health care debate. Ohio Senator Sherrod Brown, author of the Senate bill’s public option, was clearly the event’s main attraction. 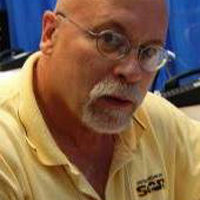 Brown cited the event he had earlier in the day in Cincinnati, saying “all the advisors and experts told me, ‘Don’t go to Cincinnati, they’re all religious nuts and right wingers there, they’ll chase you out of town.” Cincinnatians, Brown said, were “regular folks, people who work for a living and who need health care. Some 1,400 of them came out this morning to support us and urge us to keep fighting for real health care reform!” The building exploded into cheers and chants. The rally was just the latest and biggest example of how the public mood is shifting strongly here in favor of real health care reform, with a public option. The interfaith events brought out hundreds and helped reframe health care as a moral issue. Beside Sen. Brown’s Cincinnati event, he also held a town hall in rural Dover, Ohio. To the surprise of some, hundreds turned out in support of health care reform. Service Employees union sponsored a large, successful event in here with Howard Dean and Rep. Marsha Fudge also held a big and enthusiastic event in Cleveland. Right wing “teabaggers” have mobilized in attempts to disrupt most of the events, but have been greatly outnumbered. They do appear, however, to have strongly inspired thousands of regular folks to turn out to support the need for health care reform.